OST to PST Converter software is a secure and easy to helpful application to recover outlook OST file. This OST converter software can as well refit corrupt OST file and get mailboxes data (emails, inbox, outbox, sent, drafts, attachments, contacts & calendars). OST to PST Converter can speedily convert recovered emails to PST & huge different formats. Converted outlook PST file can be used in outlook to access all your emails. 1. Simple way to scan and recover data to corrupted OST file. 2. Easily export the recovered mailboxes to PST, EML, vCard, vCal, MSG, MBOX & EMLX file format. 4. You can recover and convert all emails with too, cc, bcc, subject, and attachments. 5. Demonstrate preview of recovered emails before the real conversion. 6. Supports OST file from Microsoft Office up to 2016. 7. Keep virtual folder structure of mailboxes after conversion. 8. 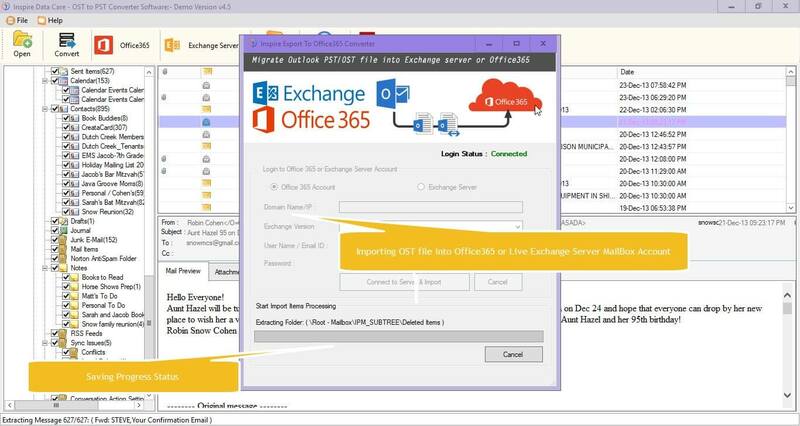 It also supports Office 365 & Exchange Server Accounts. 9. You can easily convert 30 email per folder with free demo version. 10. Permit to save of converted data to your expected location or folder. If you want your entire data back, Inspire Data Care provides one authenticated and reliable converter which convert corrupted OST file to PST quickly and easily. It is highly useful to retrieve our OST data back without losing any data.